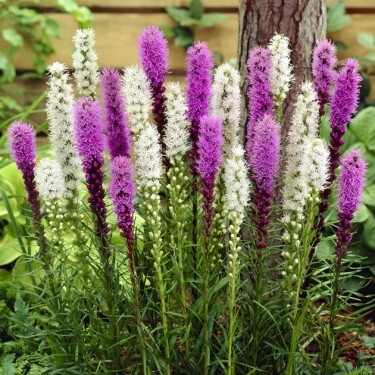 It's hard to find plants that will withstand dry, drought conditions but Blazing Stars can do! Their lovely, tall flowering spikes need little attention to bloom in full glory. In fact, their stems are so strong and sturdy that you don't even have to bother staking them….nothing could be easier! If you have problems with deer then no worries hear, your Blazing Stars will be left alone! Blazing Stars have an attractive fluffy look and the tall spikes flower from the top down which adds to their intrigue and interest. And if that weren’t enough you can also use these beauties as cut flowers – imagine a vase full of these – wow!